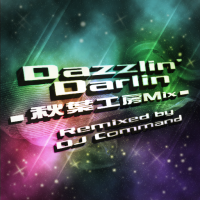 Dazzlin' Darlin-秋葉工房mix- is a eurobeat remix of Dazzlin' Darlin, from beatmania IIDX 15 DJ TROOPERS. The full version of Dazzlin' Darlin-秋葉工房mix-, titled Dazzlin' Darlin -秋葉工房 '09 Extended mix-, appears on Ryu☆'s first album, starmine. Dazzlin' Darlin-秋葉工房mix- is one of the PARALLEL ROTATION DJ TROOPERS EXTRA STAGEs in beatmania IIDX 17 SIRIUS. Dazzlin' Darlin-秋葉工房mix- is one of the hidden remixes in DanceDanceRevolution X2. It can be unlocked from October 6th, 2010, by obtaining a AAA on Dazzlin' Darlin. On the American and European releases of DanceDanceRevolution, Dazzlin' Darlin-秋葉工房mix-'s title was changed to Dazzlin' Darlin-AKBKmix-. Dazzlin' Darlin-秋葉工房mix- is used as background music in a mission on the KONAMI arcade game ROAD FIGHTERS (ロードファイターズ). Dazzlin' Darlin-秋葉工房mix- can be unlocked in beatmania IIDX INFINITAS for 800 DJ POINTs. Dazzlin' Darlin-秋葉工房mix- received a new jacket in DanceDanceRevolution A, which capitalizes the "M" of its subtitle (although this change was not reflected on the songwheel). This song is a new remix of Ryu☆'s song Dazzlin' Darlin. The original song was in an energetic and lively atmosphere, so I decided to add some euro elements to the song. This meant adding more aggressive lines to the song, but I also wanted to aim for a more casual crowd. If you'd like to listen to this, turn up the bass, but not too loud (so as to not disturb the neighbors). This page was last edited on 27 February 2019, at 15:17.